The study weekend locale provides easy access to some wonderful botanical sites. We'll see widely differing habitats with distinctive and beautiful plants. Each night we return to the same hotel where the conference will be held. On Friday, we go east for one of the region's most distinctive habitats: the New Jersey Pine Barrens (see the article in the fall issue of the Quarterly). Here we will see a forest of pitch pines (Pinus rigida) dwarfed by extreme conditions and frequent fire. We'll see sand myrtle (Kalmia buxifolia, syn. Leiophyllum buxifolium) and the famous pixiemoss (Pyxidanthera barbulata), a cousin of Diapensia. We'll visit one or more bogs to see the northern pitcher plant (Sarracenia purpurea), sundews (Drosera species), the strange, tiny curlygrass fern (Schizaea pusilla), and many other fascinating plants. Each day, we will have three guides with a thorough knowledge of the plants, so someone will always be on hand to identify a plant or to answer questions. The two-day event is limited to 39 participants. Each day we depart from and return to the conference hotel (Sheraton Great Valley in Frazer, PA). The walks will be mostly easy, but with some moderate hills and rocky ground. Registration includes transportation (by vans) and lunches. Pre-trip participants are responsible for their own breakfast, dinner, and hotel arrangements. The conference hotel is offering a discounted room rate on Wednesday and Thursday nights, but the discount is subject to availability. Therefore, we recommend reserving your room promptly. The hotel has two full service restaurants, and there are many other food options nearby. The pre-conference tour fee is $190. To participate in the pre-conference tour, you must also register for the main conference. Note to Delaware Valley Chapter members: to give first chance at tour slots to those from outside our area, Delaware Valley Chapter members who register for the pre-tour will be put on a waitlist. Kalmia buxifolia (syn. 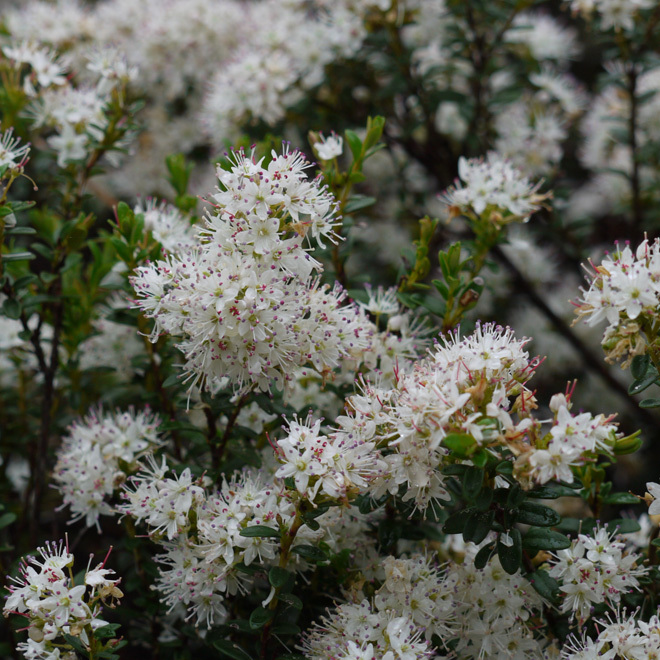 Leiophyllum buxifolium; sand myrtle) should be in bloom on our pre-trip. Photographed May, 2011 at Whitesbog, New Jersey. Photo by Janet Novak.